A man stands with hands on his waist. Near him is a diagram of some sort. In the foreground, and towards the right, a woman sits on a comfortable chair looking towards the man. Woman: You've drawn an excellent diagram! And your resume is awesome. But will you fit well in our agile programming environment? The next panel shows only the man and the diagram both in a closer view. The man is holding in his right hand what might be a writing implement. His right arm shows signs of movement. The diagram contains six horizontal boxes, vertically stacked, respectively containing the following hand-written text: Requirements; Specifications; Implementation; Testing; Deployment; Maintenance. Adjacent to this stack of six boxes, and as tall as the stack, is a narrow vertical box containing the hand-written text: Documentation. 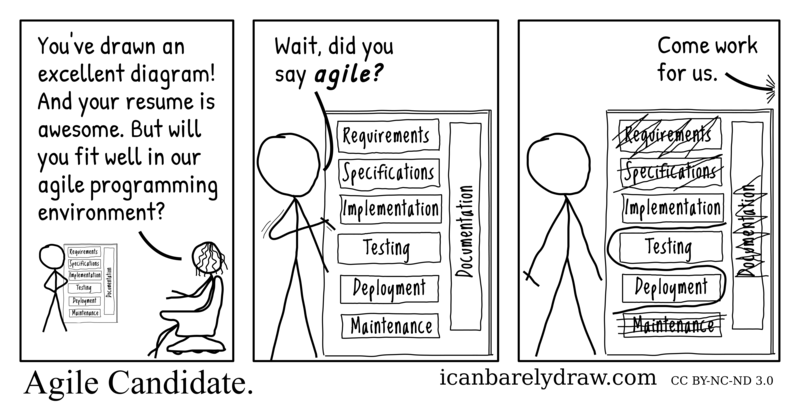 Man: Wait, did you say agile? The third and final panel again shows the man and the diagram. The man is standing still and still holding the writing implement. On the diagram, however, changes have been made. All the boxes have been crossed out except the following three: Implementation; Testing; Deployment. Additionally, a large S-shaped line has been made, suggesting in typical proofreader's style that the positions of the Testing and Deployment boxes should be interchanged. Off-panel voice from the right: Come work for us.